To this end we made a point of visiting and spending time at the three main holy sites of the city: the Western Wall, the al-Aqsa Mosque and the Church of the Holy Sepulchre. Afterwards we met with two Shaykh Yusuf Abu Sneina, Imam of the al-Aqsa mosque and Rabbi Yechiel Grenimann of Rabbis for Human Rights. Tomorrow morning we’ll be meeting with Revered Naim Ateek of the Sabeel Institute to round out our visits with faith leaders. Our tour is being led by Aziz Abu Sarah and Kobi Skolnick – who are Palestinian and Israeli respectively. Both Aziz and Kobi are remarkable individuals with powerful personal stories. Aziz is a native of Jerusalem who became radicalized at a young age after the death of his older brother at the hands of the IDF. He became active in the youth movement of Fatah and participated extensively in Palestinian resistance actions during the First Intifada. Kobi’s story is no less amazing. Born into a Chabad family in Israel, he moved to a settlement in the West Bank during his high school years. There he become a member of Kach – the Jewish extremist movement founded by Rabbi Meir Kahane that actively promotes violence against Palestinians. During his service in the Israeli army Kobi went though a personal transformation as he confronted the reality of the conflict. Today, Kobi is highly involved in the Israeli-Palestinian peace movement – he was one of the original members of Breaking the Silence and now studies conflict resolution. He travels widely as a trained mediator and facilitator. Tomorrow we’re off to tour East Jerusalem and Bethlehem before spending two nights in the Deheishe refugee camp. Stay tuned. 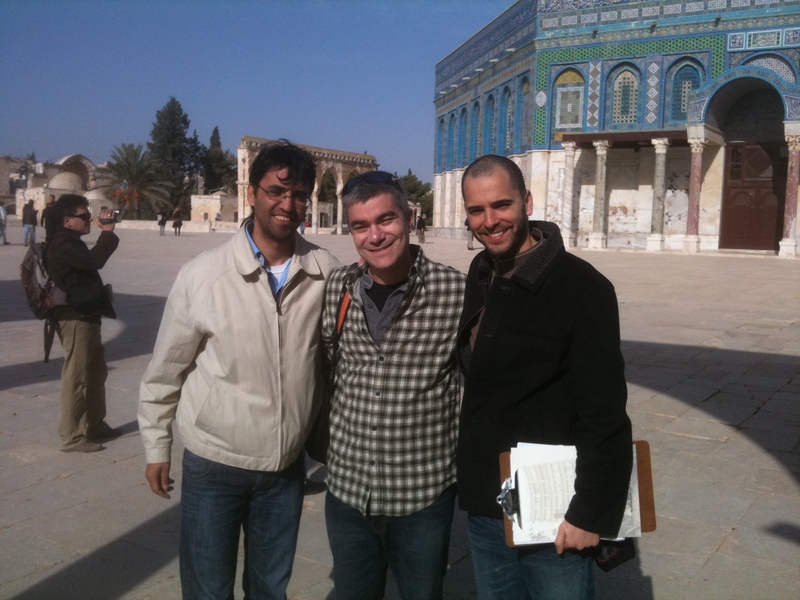 This entry was posted in Interfaith, Israel, Jerusalem, JRC I/P Study Tour 2010, Palestine, Peace on December 21, 2010 by Rabbi Brant Rosen. As a former settler turned peace activist, I applaud your initiative. What a fantastic trip. You are breaking new ground and creating a new model for congregational trips to Israel. Keep the reports coming. Oh, holy wow. This sounds amazing. This is what I wish my first trip to Israel had been like (instead I was on a UJA/Federation Mission to Israel, which had some lovely moments but left me feeling frustrated about the way the trip’s organizers seemed to presume that Jerusalem, and Israel writ large, were, as you say, Jewish places which might happen to be important to some other people too.) Kol hakavod to you for taking a group in this way — and for your perennial willingness to engage lovingly with what’s so difficult about Israel and its realities. This sounds absolutely wonderful. I remember Kobe well from many of our Brit Tzedek conferences, as he was a longtime activist with our New York chapter. Now that we are part of J Street, I know that he is speaking at many of our J Street U campus events, sometimes with Aziz, and students are always quite moved by him. Aziz, also spoke at a number of Brit Tzedek events and was always well received. I’m so pleased to learn about their latest venture, and I wish I could be there with you. I visualize the headlines on the Jewish News. How can they top the one that called attention to our (JRC’s) open discussions? Truly, you are breaking ground, and I kleib naches as one of your congregants. I comment that the sentence beginning with the word “but a” is doublespeak. Webster’s dictionary defines doublespeak with these words: evasive, ambiguous, high-flown language intended to deceive or confuse. I am a reformed christian and I believe that a capital in Jerusalem for the Palestinian People MAY come at some time in future; but such a thing will ONLY come through announcement by the Sovereign of Daniel 9:27, who is also the same Sovereign of Revelation 13:5-10. Germans interested in Israel like myself (67). so I checked the http://settlementwatcheastjerusalem.wordpress.com/about/and found your blog. Very recently I paid a short visit to old friends on Grey Avenue in Evanston – small world. I will be following your travel reports with great interest. Thanks for sharing your experiences in Israel with us. It seems that you will be able to give us an up to date on site description of the Israel-Palestine situation. I look forward to your updates of your groups’ study tour. My favorite DVD these days is Little Town of Bethlehem – and this post so reminded me of it. There are truly amazing people on both sides in Israel/Palestine who are interested in and committed to a nonviolent and empathetic approach to ending the occupation, violence and dehumanization of “the other”. I look forward to your future posts on this trip. Bless you for your blog and for your courage. What a great pic, and what a moving story. Keep up the reports. Kol ha’kavod to the great work you are doing! Judging by recent events in Minnesota and Illinois, the time to worry for Americans who travel to Palestine is when they return and find the FBI wants to talk to them. It’s very discouraging when, in the land of the free and the home of the brave, our government has nothing to say about the harassment and arrest of non-violent protesters in the occupied territories and goes after our own citizens who simply visit. Perhaps you will be able to visit the protest tent in Silwan when you visit East Jerusalem. If so, please pass the word to Adnan Gheith that there are Americans who are following what is happening to him and wish him well. Which one is the rabbi?